My mum said something to me yesterday that really made me think. 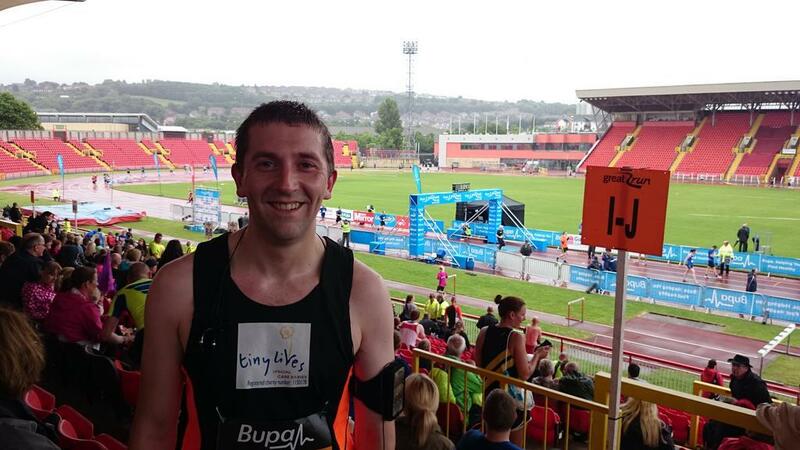 I was sitting with my parents and Little Man in the spectator stands at Gateshead Stadium, cheering on the drizzle-soaked runners making a torturous circuit of the athletics track before crossing the finish line of the Great North 10k, a race I had competed in myself the previous year. I had felt it necessary to sit this one out as I’ve been struggling with some minor leg niggles in training for the Great North Run and couldn’t risk doing more damage that might put me out of the half marathon. My husband Andy, on the other hand, had just put in a sterling performance in the event, and stood with us soggy but happy with his new personal best and another medal around his neck. We had seen him entering the stadium to complete the final few hundred metres of the race quite easily, as the luminous orange panels on his Tiny Lives vest stood out brightly on such a dreary day. This was the first time the vest had been worn in an event, and we were proud to be flying the Tiny Lives flag, along with the logos of the brilliant businesses who had sponsored us for our fundraising printed on the back. I realised at that point that I had never really thought about it. I considered everything that might constitute ‘all of this’. 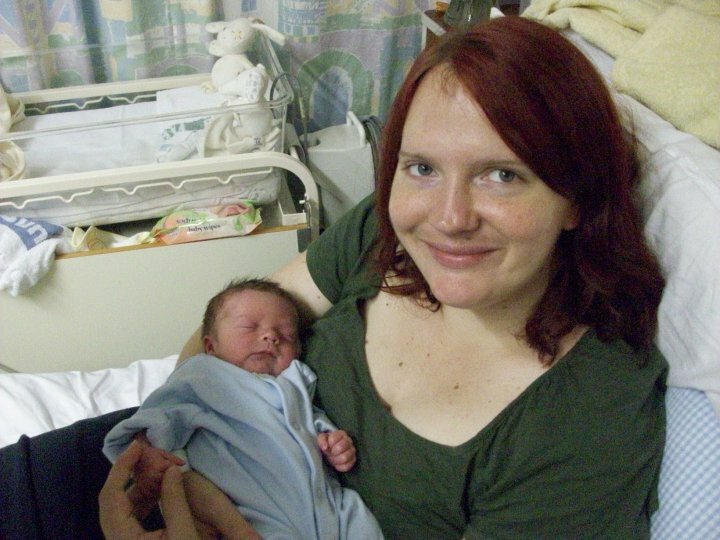 Joe was born in September 2010 at 37 weeks, following an induced labour due to pre-eclampsia. Eight months later, when I felt physically able and mentally ready to, I signed up to Weight Watchers online. I started running, slowly at first, but seeing gradual and steady improvements as the pounds dropped off. By Christmas 2011 I had dropped 3 stones and 3 dress sizes. 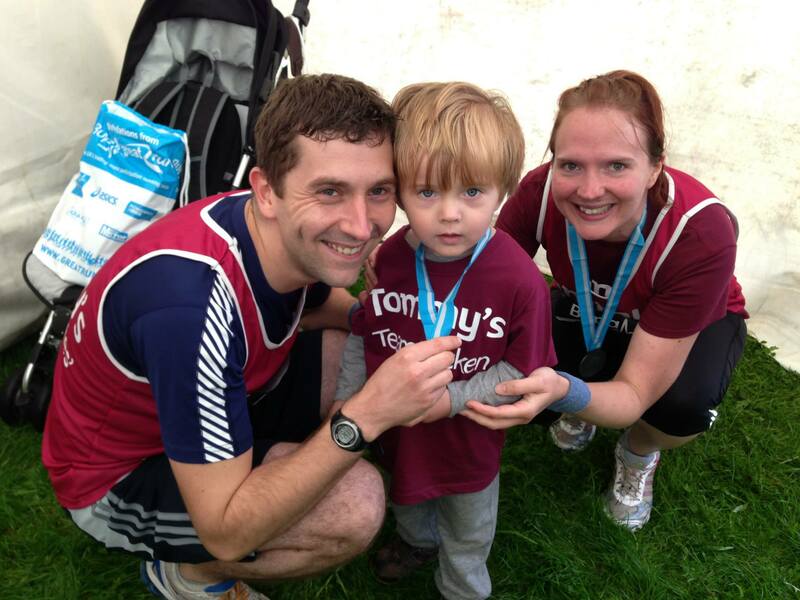 In May 2012 I ran my first ever 10k race, the Great Manchester Run, raising money for Tommy’s, a charity I had come across as a result of looking for information about what had happened to me. Few things have ever felt like more of an achievement than crossing the finish line on that day. At the start of 2013, I threw myself into more fundraising, this time organising an online auction for Tommy’s through our newly established Facebook page Bids For Babies. I got myself onto Twitter to help publicise the auction and, it’s probably safe to say, I have never looked back. I ran the Great Manchester Run again, as did Andy, and in September we ran the Great North Run together, Andy spurring me on as I did what once I would never have considered possible. We raised over £1100 for Tommy’s. We have also been fundraising for Tiny Lives, the charity which supports our local SCBU in the hospital where Joe was born, and we’ll be doing the Great North Run again this year to raise more money. I started writing again, something I used to love as a child and teenager with dreams of becoming a famous author or journalist, but had somehow lost along the way. I seized the opportunity to contribute guest posts when they came along and in August last year I started the Great North Mum blog, the alias I gave myself when I joined Twitter as a reference to my run training but which has now taken on a life of its own! I have my own little corner of the Internet I am very proud of, now including Blogs For Babies which is a wonderfully fulfilling side project I am really enjoying. It was also last summer that I changed jobs and started working for the Northern England Strategic Clinical Networks, part of the NHS which focuses on regional collaboration for service improvement in various clinical areas, of which Maternity and Child Health is one. I am so grateful for the opportunities and wonderful connections my job has enabled me to make. I have realised what I am truly passionate about. Most recently, I joined MAMA Academy as a volunteer and have somehow ended up being their Media Coordinator, a role which I couldn’t be more proud to have. Having the opportunity to make a positive difference to the pregnancies of other women, which I am also extremely lucky to be able to do as part of my ‘day job’ with the NHS, is an absolute honour. So, do I think I would have done ‘all of this’ if it wasn’t for the way my pregnancy ended? Honestly, my gut tells me probably not. I might have put some effort into losing the baby weight, but without the thought of my future health thanks to the unknown long-term effects of the pre-eclampsia, my fitness to be an active mum to the little man I was so lucky to have, and the likelihood of complications in a subsequent pregnancy, I don’t think I would have had the motivation to do as much as I did. I doubt I’d have ever pulled my finger out to do a half marathon. I might have supported someone else’s fundraising, but without the gratitude I felt towards those who had helped me have a happy ending to my complicated pregnancy and the affiliation I then felt to the charities trying to do something about the cause, I don’t think I would have put the effort into raising money and awareness myself. I am almost certain I wouldn’t devote the time I do to volunteering and to feel so strongly about what they are hoping to achieve. I might have come across the job opportunity I did, but without the true desire to see things improve for everyone using NHS services, for all the deserving mums and babies, for all those who are not as fortunate as we were to bring our baby home, I doubt I would have been so convincing at interview or have found my niche on the Maternity team in the way that I have. My passion drives my work everyday. Our life experiences cannot fail to shape our futures, but I count myself lucky every single day for the position I find myself in. I interact with some amazing people online on an almost daily basis who are driven by their own experiences, often infinitely more tragic than mine, but all wanting to change the future for others when their own lives have already been changed forever – Jennie Henley raising the profile of SIDS after the loss of Matilda Mae; Leigh Kendall making people aware of HELLP syndrome following the passing of little Hugo; and the inspirational Heidi Eldridge, founder of MAMA Academy, working tirelessly to reduce stillbirth in memory of her son Aidan. We are all travelling down paths we wouldn’t have chosen in order to show others the right way. That’s not to say people have to go through an adverse experience to want to make a difference but in my case, on reflection, it has definitely affected my choices. And for ‘all of this’ to come out of a situation over which I had no choice is an achievement I am really proud of.